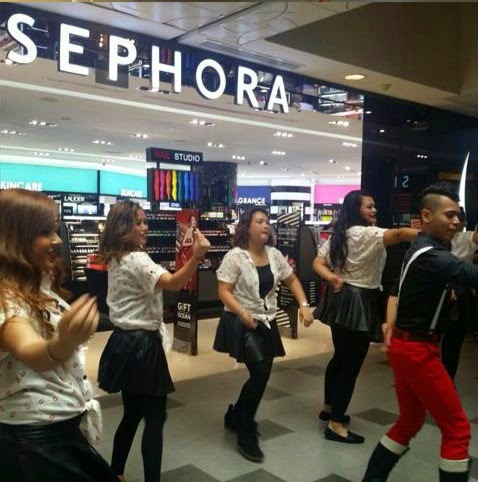 Sephora Tampines 1 is Now Open! 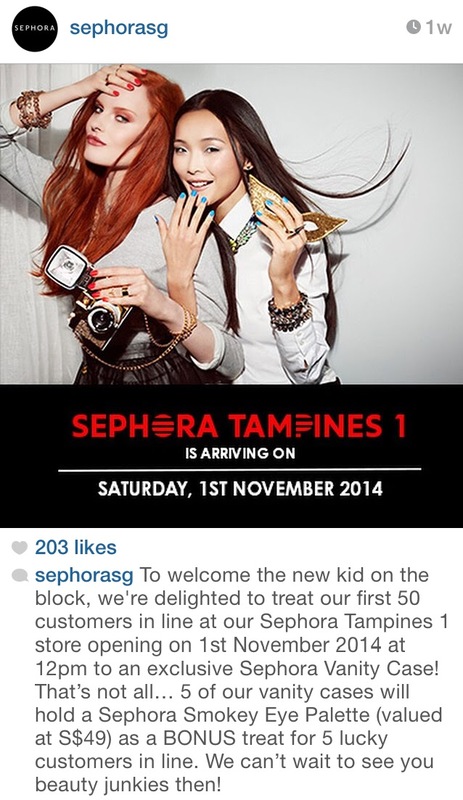 | Sheena V.
Sephora Tampines 1 is Now Open! Now this was an exciting revelation, not only because there will now be a Sephora a bus ride away, there were gonna give out Vanity Cases to the 50 customers in line! You see, I bought Sephora's small acrylic train case slightly over a year ago. However, I have accumulated an embarrassing amount of makeup in that short span such that it doesn't hold everything anymore. Lol. Initially, I was hesitant to go queue like a typical Singaporean (paiseh you know). Q was actually nice enough to volunteer to queue (hurhur) for me. Despite that offer, I decided to go along with him. Yalah takkan I subject him to embarrassment alone right? We went there quite early, not gonna say what time we were there because the mere fact we were queuing was embarrassing enough. :x We later found out that we didn't really need to as the main bulk started queuing at about 11:20am? The store was scheduled to be open at 12pm. Although, being there early did have its benefits: person no. 20 onwards had to queue outside of the building. I think that one more paiseh. Hahaha. I also made friends with the lady behind me and we started chatting to pass time (Q was more interested in the shows on his tablet). Both of us were also trying our best to avoid all form of photography. No thanks! So anyway, when it was finally open, I whizzed through the aisles to check out the range available before collecting the vanity case. We didn't linger too long after as it was overcrowded (Q doesn't like crowds and I prefer to look at make up in peace). Plus I had work to do back home. I already spent a bomb in the recent Black Card Member sale anyway. Heh. Not to say I won't be back when the excitement dies down though! Without further ado, let me present to you Sephora's Exclusive Vanity Case! To be very honest, I was only expecting it to be the bigger version of the one I already have. Not complaining though, this one is impressive with the brand name emblazoned on the front. It's also MASSIVE. I measured it to be 10'' x 7'' x 7''. To be honest, I only discovered this extra insert after viewing someone else post a picture on to their Facebook page. Last but not least, guess what? 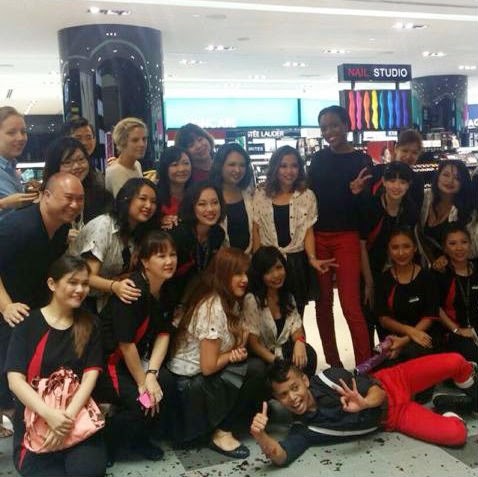 Q's vanity case was one of the lucky 5 to have the Sephora IT Palette included la seh! To be completely frank, I couldn't care less about the palette because I've swatched it in store prior to this and it didn't impress me. I gifted it to my mum instead. Hahaha. I did however take pictures of the swatches of the eyeshadows in the palette and will post them up when they're ready. Thus that marks the end of my story. It was a really (somewhat) exciting morning with Q because it's not something we usually do. By that, I mean queuing up way before time. Probably not gonna do that again any time soon. Haha. 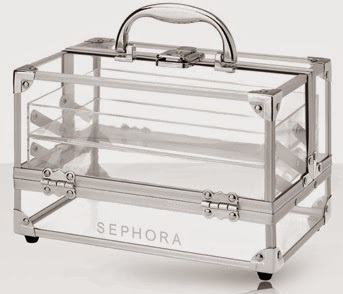 Sephora small train acrylic case, available here.